A research method based on walking allows mirgrants more agency over the process. Graffiti in Chios, Greece, 2016. Credit: 2016 © Maggie O'Neill. The mass movement of people across borders has been one of the defining features of the 20th century and 21st century. And yet there continues to be an astonishing lack of accountability and responsibility by governments and states for their part in the production of the world’s refugees. In an age of globalisation, sovereignty is vigorously asserted at the borders of nations. Increasingly restrictive immigration policies instigate the humiliation and social marginalisation of people seeking asylum as well as those who have lived in the UK for a lifetime and call it their home. Research into migration can play a vital role in exposing the cruel and destructive impacts of those policies both in the UK and across Europe. But it is vital that researchers avoid causing migrants any distress in the process. If not treated with care, research can run the risk of being tokenistic, voyeuristic and reinforce power imbalances in the interests of gathering research data or images that are representative. Inspired by walking artists such as Dee Heddon, Misha Myers and Clare Qualmann, I have found that walking can be a useful tool for addressing the problems and challenges that arise when conducting research on sensitive issues with marginalised individuals, groups and communities. As part of my research, I walk with people along a route of their choosing that is connected in some way with their experiences of borders, risk or belonging. Taking a walk with someone can be an effective way of communicating; it opens a space for dialogue where embodied knowledge and memories can be shared. A young man had jumped into the water, intending to swim back to Turkey. Because he had not arrived by boat the authorities would not process him. In Searching for Asylum, a film I made together with Jan Haaken and ten women asylum seekers, we undertook a collective walk in Teesside that elicited their individual and collective stories of safe zones and danger zones and their lives made out in the borders of the city. The film used participatory, walking and biographical methods to document and share the women’s stories, which in turn served to counter exclusionary processes and practices. In 2016, at the height of the refugee crisis in Europe and austerity in Greece, I walked around the island of Chios with the photographer John Perivolaris. The themes of borders, risk and belonging are writ large in the history of migration to Chios; the population exchanges between Turkey and Greece in the 1920s; the physical, material geography of the island; and in John’s own past. Listening to John share his biography, while walking through the streets of Chios – his grandparents arrived in Chios as part of the population exchanges – was resonant of my previous research with Bosnian refugees. We discussed the concept of internal borders and what happens when you are torn or expelled from your home and lose your sense of belonging, as was the case with population exchanges in the past and now with refugees seeking new lives in Chios. Such a traumatic experience forces one to repress certain things in order to be, live, survive and make a life in their newfound home. This mobile experience, attuning to John’s account of his family’s experience of migration, raises the importance of working through the past. There is a vital need to focus on everyday human experiences and personal histories when conducting arts-based research. 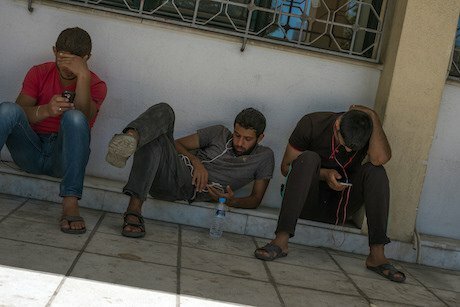 Refugees waiting outside Chios town hall, 2016. Credit: 2016 © John Perivolaris. When we reached Souda Refugee Camp in Chios, which we were invited to by an aid worker, our attention was caught by the commotion of a small crowd gathered nearby. They were looking out to sea. We walked towards them and a Palestinian man came over to us. He told us that a young man had jumped into the water, intending to swim back to Turkey. Because he had not arrived by boat the authorities would not process him. We had seen the young man, an amputee, two days earlier pacing agitatedly about on crutches with his amputated leg dressed in a dirty, thick white bandage. 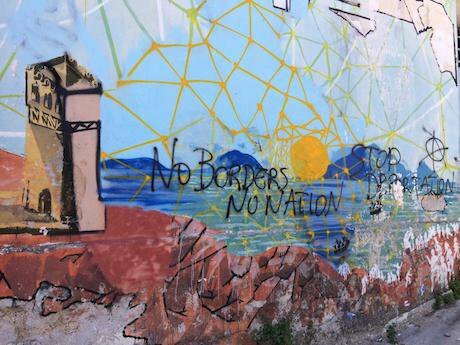 Our conversation on leaving the camp was focused on the material, symbolic and psychological borders we experienced there: the borders between people and the border, concealed by body of water, between Greece and Turkey. John and I asked how do we share this work, with respect and recognition with the people waiting today in limbo for their asylum claims to be processed? How do we ensure that what we witnessed in the service of social justice does not slip into an empty and cold forgetting? When suffering is consumed something of its horror is removed and there is a danger of perpetuating injustice – what the academic Julie Salverson has described as an aesthetics of injury. There are some answers to these important questions for artists and researchers in openDemocracy articles by Umet Erel and Behjat Omer and Umut Erel, Sara de Jong and Alia Syed. For Omer, there is a crucial distinction between people being witnesses and observers. He writes: “When you look you are far away, but when you witness you are too close to avoid it. When you are witnessing a situation you are responsible. You are responsible for a lot of things, you are responsible to help – I don’t know how you would help. But you are in a situation where you really have to think about where you are standing. You have a huge responsibility on your shoulders”. 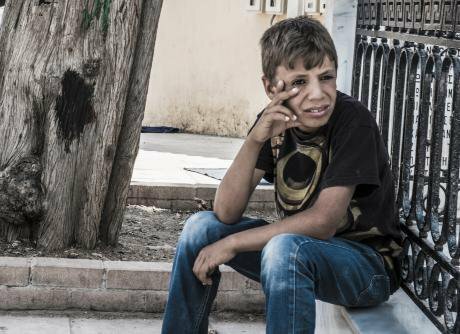 A young refugee in Chios, 2016. Credit: © 2016 John Perivolaris. This notion of witnessing connects with our experience in the Souda camp and my own methodology of ‘walking with’. I want to create a space for dialogue, narratives and images around exile, displacement, belonging and the possibilities for social justice through a politics of recognition — as a counter to misrecognition. Participatory research, biographical research and participatory arts are my chosen methods. Ethical principles must guide this work, so permissions, informed consent and modes of dissemination are agreed at the outset and may change in the process of the work being undertaken and led by the participants. Photographers and artists such as Alketa Xhafa Mripa, John Perivolaris, Behjat Omer and Alia Syed are making work in collaboration with audiences that offer space for witnessing and bring representational challenges that enable us to think against the grain, to think otherwise. This in turn mitigates against an aesthetics of injury. Researchers, artists and academics can contribute to social justice by harnessing the transformative power of the arts through participatory action and participatory arts research in collaboration with migrants. By opening, and keeping open, a radical democratic imaginary, participatory social research can help to communicate what for many might have been otherwise impossible to articulate. With thanks to Sara de Jong and John Perivolaris.